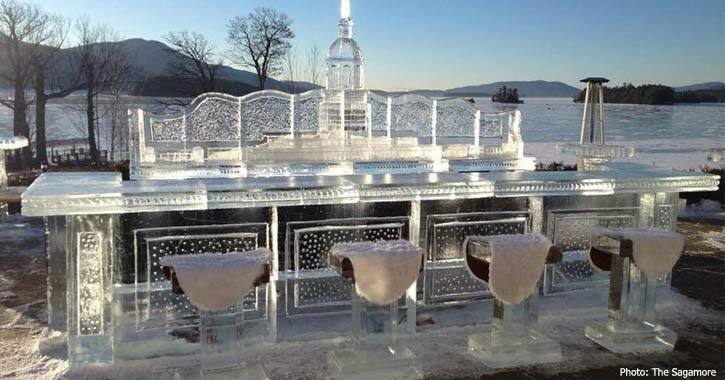 Ice bars are one of the hottest trends sweeping Lake George, NY! These cool attractions feature bars, seating, glasses, and even props carved from thousands of pounds of ice. Below, you'll find a guide to ice bars in and around Lake George and the Adirondacks. Be sure to hit up these hotspots while you can, as they're only around for a limited time each winter season. When: Fridays and Saturdays from January 25 - 26, 2019 and February 1 - 2, 2019. See 18,000 pounds of ice transformed into one of the coolest lounges in the Adirondacks: The Glacier Ice Bar & Lounge at The Sagamore is an unparalleled experience. After sipping cocktails at the ice bar, duck inside to warm up next to the cozy fireplace at Caldwell's Lounge, or check out delicious hors d'oeuvres and Italian delights at La Bella Vita. The Funky Ice Festival will return and take place during two weekends in 2019! There will be multiple ice sculptures to interact with, including two bars made of ice, an ice beer pong table, and more. This is one ice bar you won't want to miss! The Holiday Inn Resort will be joining in the ice bar fun in Lake George! Check out the Forest Ice Bar, featuring a winter wonderland of ice sculptures and a magnificent ice bar. Visit the Lake George Beach Club during the Lake George Winter Carnival for ice bar fun, happening every weekend in February. Come check out the Polar Ice Bar at Fort William Henry during the second weekend in February! The ice bar will be located at the back of the Grand Hotel with a full view of Lake George. The ice bar will be open February 9-10, 2018. There will be ice sculptures, a fire pit, music, hot and cold drinks, and more. For 2019, King Neptune's Pub in Lake George will feature an ice lounge at their restaurant! The ice lounge will open on Friday, January 25, 2019 and include live music, an ice luge, ice shuffleboard, ice corn hole, and more. EQX will be on site, and Wild Adriatic will perform along with Multipede. Open seven days a week, starting at 11:00am. Check back for full hours of operation when they are announced! Head to The Garrison for their ice bar January 30th through February 3rd! Know of any ice bars that we missed? !